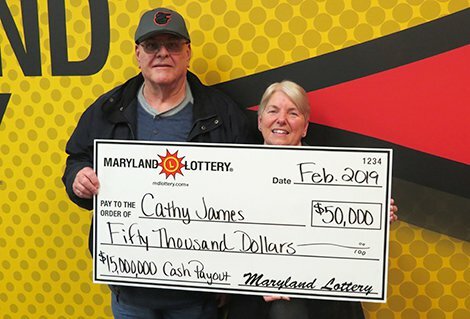 The wait was worth it for David and Cathy James of Hagerstown, winners of a $50,000 top prize from a $15,000,000 Cash Payout! instant ticket. Cathy and David James lead busy lives; he handles a full-time job and she helps her daughter care for twins. Both will soon get a break, thanks to the Maryland Lottery’s $15,000,000 Cash Payout! scratch-off game. The $50,000 top prize the Hagerstown couple just claimed could help David retire earlier and join his wife with the grandchildren. The lucky pair have David’s work on a highway project to thank for putting him in the right place to find their fortune. On that day, the lucky granddad stopped at Brown’s Liquors & Deli in Frederick and purchased four $15,000,000 Cash Payout! instant tickets. The Washington County scratch-off fans play instant tickets together once a week. While the two $15,000,000 Cash Payout! scratch-offs he completed produced no wins, David quickly realized that his wife had discovered something on her instant ticket that she’d not expected. “I couldn’t speak, just couldn’t get any words out,” Cathy said. “I pointed to the match, to the $50,000. When I finally caught my breath, I asked David if it could be real.” This magic Lottery moment took place in late January, just before Maryland’s cold spell rolled in.